Ft. Lauderdale Beach rent to vacationers for rental income or take advantage of the developer's 8% leaseback guarantee. Studios from $400s, one-bedroom from $500s, two-bedrooms from $900s. Sold fully furnished! 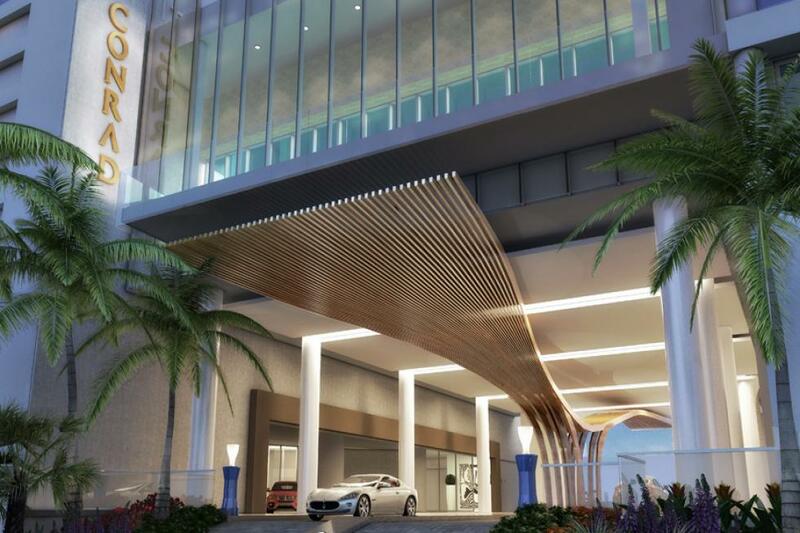 The Fort Lauderdale Conrad Hilton developer offers an 8% fixed income guarantee through a leaseback program on the studio and one bedroom units, in addition to allowing the owner to use it up to 90 days per year – even during peak season. For example, if you purchase a studio unit for $500K, you will get $40K per year. Enough to cover property taxes and all costs associated with the condo/hotel plus a nice profit. After three years, you have the option to rent it on your own, with a realtor, or continue with Conrad Hilton management. Of course, you can also sell it at any time. Since Conrad Hilton is at the upper end of luxury hotel brands, rental rates are excellent. Good for unit owners. In addition to the studio and one bedroom residences, two bedroom units offer a 4% leaseback option for five years. Another option is the Self Rental Program. All residences are eligible to be used by the owner for 120 days; 60 days high season/60 days low season. Additionally, owners may rent the residences as many times and for terms they decide, which includes housekeeping and laundry. They can also utilize the services of a traditional condo hotel management company. For almost anyone looking for a South Florida vacation condo, a condo hotel is a no-brainer. Own a luxury condo on Fort Lauderdale's most popular beach but let vacationers pay your monthly expenses - plus a profit. Most of today's top luxury brands now offer full or part time residences with the option of a rental program. The Four Seasons, Ritz Carlton, Waldorf Astoria, The Plaza and Conrad Hilton all offer condo hotels. Most of the newer Las Vegas hotels such as MGM Signature, Trump International, Palms Place, Vdara at City Center and the Platinum Hotel are condo hotels. Condo hotel prices are comparable to traditional luxury condo prices, but offer much more. South Florida condo hotels are usually located in the best beach areas, resort-style pools, on-site restaurants, daily maid service and much more. Fort Lauderdale is called the Venice of America because of its beautiful canal system. It is also known as the Yachting Capital of the World with over 100 marinas and many of the world's largest yachts. The city's arts and entertainment district runs along Las Olas Boulevard, from the beach to the heart of downtown. In addition to its beaches, world-class restaurants and nightlife, Fort Lauderdale is home to the International Swimming Hall of Fame, Hugh Taylor Birch State Park, Bonnet Museum & Gardens and the International Boat Show. Miami Beach, Boca Raton and Palm Beach are just a few miles away.